The food truck craze has officially invaded Fairfield County. Until last year there were less than a handful of colorful food trucks gracing the streets and parking lots of Fairfield County. Last year, the circular driveway outside the Beer Garden at Harbor Point became their go-to location, the choices expanded and lines confirmed that people finally accepted the fact that great food can be both prepared and served from a rolling kitchen. Traditionally limited to a griddle or grill in food preparation, I was intrigued to learn that one housed a rotisserie and excited when I discovered that they served porchetta, one of my favorites. I checked their Facebook page for their location. Was there fire behind all of this rotisserie smoke? As I approached the brightly colored truck with its bold “VanChetta” adorning the sides and “?YRGNUH” emblazoned on the front, I had a good feeling. The line was several deep and others were already enjoying a variety of Chef/Owner Andy Dolan’s creations at surrounding picnic tables. I always start with the chef’s strength and in the case of VanChetta it is the Porchetta sandwich, which is pork loin and belly, seasoned and rotisserie roasted, topped with VanChetta slaw, melted provolone, red onion marmalade, a little garlic mayo and served on a soft roll. I purchased my sandwich and wandered to an empty picnic table. Let’s start with the conclusion; this is one of the best sandwiches in Fairfield County, one of the best I have eaten in a really long time. Yes, it was that good. It encompassed all the features that make a great sandwich. First, the chunks of perfectly roasted meat were absolutely delicious, with great flavors, textures and then a hint of spicy and salty hit the palate. The VanChetta slaw was a delightful creation of shredded cabbage and kale, red onion, carrots, thinly sliced apples, sunflower and pumpkin seeds, and finished with apple cider vinaigrette. The red onion marmalade (described by Andy as “that neon purple color” from Grenadine syrup) added the sweet-sour component. Andy then finished the combination with the creaminess of a little garlic mayo and Provolone cheese, all stuffed into a soft roll. This is a must-have sandwich. It was time to meet Owner / Chef Andy Dolan. Andy was born and raised in Weston, and his love of the culinary arts began at home, his father was the chef at the Bronxville Field Club. Growing up, Andy helped his father in the kitchen and during the summers worked the snack bar at the club. He eventually moved to NYC where he worked at Bar III and eventually relocated back to Fairfield County where he worked at numerous restaurants before landing a position as a prep cook at The Inn at Pound Ridge. Working alongside some of the great chefs in the area, Andy used this time as his informal culinary training, learning how to match flavors and textures, which he now uses in many of his combinations. In 2013 he and his wife, Ketty, decided it was time to start their own business. His search for the perfect truck brought him to NJ, where many residents were still recovering from Hurricane Sandy. Originally a newspaper delivery truck for the Asbury Park Press, the then current owner had already stripped the interior and cut the window in the side of the truck with the intention to convert to a hot dog truck. Andy purchased the truck, brought it to CT and retrofitted with a rotisserie, flat top, prep, and refrigerator, a fully integrated rolling restaurant. The first step in his dream to open his own restaurant was underway. And I wanted to return for some of the other sandwiches and side dishes. My second visit was equally delicious. I sampled a few of Andy’s other sandwiches, plus a side of potatoes. 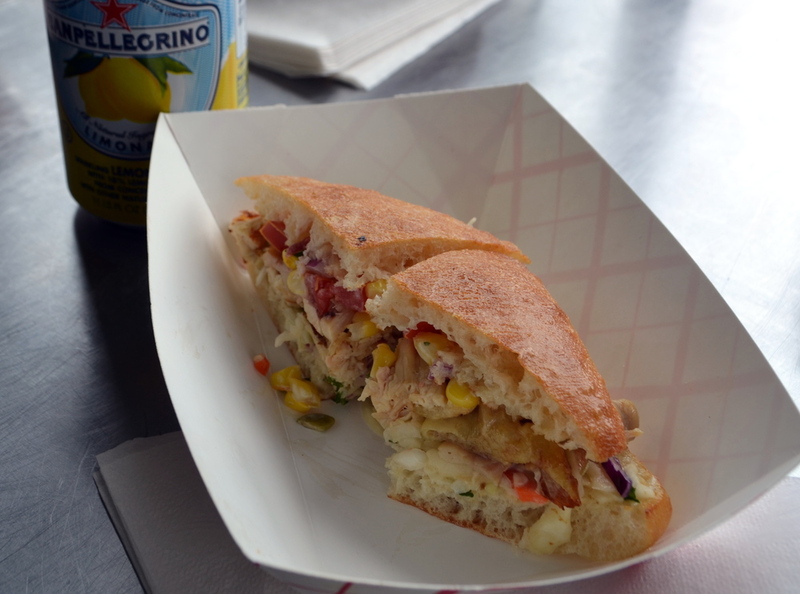 The Pulled Chicken included fresh pulled rotisserie chicken, topped with VanChetta slaw, tomato-corn salsa, and a schmear of garlic mayo. 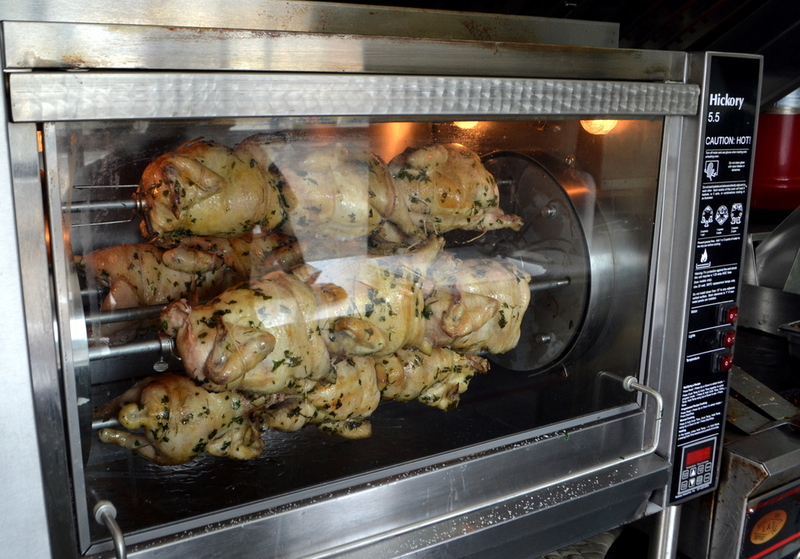 The chicken was moist and flavorful from the slow, self-basting rotisserie. The corn and tomato salad was a perfect complement, it added a sweetness from the tomatoes and corn, which also added a little crunch. The second, and lightest of Andy’s sandwiches, was the Caprese. Traditionally a simple combination of tomatoes, Mozzarella cheese and pesto, VanChetta’s had an interesting twist. Andy substituted toasted sunflower and pumpkins seeds for the pine nuts in his pesto, plus he makes his own mozzarella. The pesto was the highlight of this sandwich, with the seeds creating a delightful earthiness to the pesto. The mozzarella was firm and was a pleasant complement to the pesto. Andy mentioned that one of the biggest sellers is the “Patatas Bravas.” The crispy potatoes were first topped with a spicy tomato sauces and finished with his garlic mayo. I enjoyed the crunchiness of the spuds combined with the creaminess of the mayo and then the spiciness of the tomato sauce kicked in. This is a great side for any of the sandwiches. With VanChetta recently celebrating its first anniversary I look forward to some of Andy’s other creations to add to the growing food truck craze. Look to their Facebook or Website to find the location of VanChetta and grab one of their sandwiches.